A gesture is a form of non-verbal communication made with a part of the body, used instead of or in combination with verbal communication. The language of gesture allows individuals to express a variety of feelings and thoughts, from contempt and hostility to approval and affection. Most people use gestures and body language in addition to words when they speak. 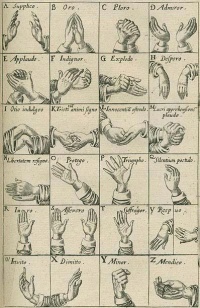 The use of gesture as language by some ethnic groups is more common than in others, and the amount of such gesturing that is considered culturally acceptable varies from one location to the next. Unless indicated otherwise, the text in this article is either based on Wikipedia article "Gesture" or another language Wikipedia page thereof used under the terms of the GNU Free Documentation License; or on original research by Jahsonic and friends. See Art and Popular Culture's copyright notice. This page was last modified 11:25, 14 December 2014.